Try as I might, I can't review Inland Empire without inserting myself into it. Call me selfish or egocentric, or accept that the movie asks so much of the viewer that he or she becomes as important to the film as the people who made it. I first heard about Inland Empire more than two years ago. I posted about it, and even then I eagerly anticipated the day I'd be able to pick it apart. Its technical release date falls in 2006, but only because David Lynch debuted it then at the Venice Film Festival. It vanished — in a very Lynchian manner, I might add — after a rather narrow theatrical release in early 2007 and I've been waiting all the while for its DVD arrival to finally see it. 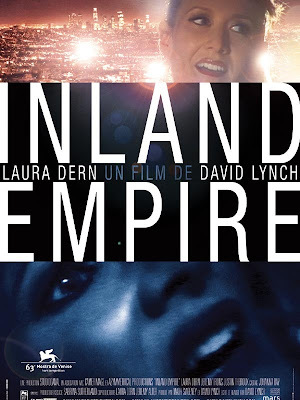 Now, more than two years after I blogged about my first awareness of it, I have seen Inland Empire. And I don't know what to make of it. Perhaps that's exactly what Lynch would have wanted, though he never would have said so in an interview. The film — so devoid of typical narrative structure that it precludes spoilers — wafts through my head like some kind of disorienting smoke. I don't know whether I'm coming or going, and I'm not sure exactly who star Laura Dern was playing throughout most of it. That's not a bad thing, mind you — I'm one of the bigger Lynch fans I know and I fully prepared myself to finish Inland Empire while scratching my head. Here's the best I can do for a semblance of a plot: Laura Dern's character makes a movie, On High in Blue Tomorrows, about an affair that ends badly. The film, in a sense, is a remake, but only because the Polish actors who originally tried to perform in it died horrifically before shooting completed. Soon, Dern no longer seems to play the actress in the movie but the character from On High in Blue Tomorrows herself. The character, Sue, devolves tragically until we see her walking the streets of Hollywood with other prostitutes, who just happen to break into a choreographed dance to "The Loco-Motion" at a moment's notice. Polish characters — not the actors who died but perhaps the real-life people on whom the Polish version of On High in Blue Tomorrows were based — appear, though the time period they exist in is left unstated. It's psychological and spiritual and at any given point, and various characters may not be people at all, but ghosts or manifestations of emotions or maybe just members of the film crew — because, after all, this movie is about making a movie, and that narrative frame can collapse or rebuild itself in a split second. 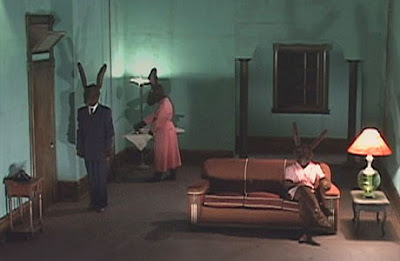 Oh, and then there are the rabbits — that is, Rabbits, a series of short films that Lynch posted a few years ago on his website and which appear in truncated format in this film. Voiced by Naomi Watts and Laura Elena Harring, the stars of the thematically similar Mulholland Drive, these lagomorphic characters exist on the set of a macabre sitcom — complete with canned laughter — and may or may not be the animal reincarnations that evil-doers suffer in some religions. Or maybe they're more benevolent than that, and their nonsensical dialogues form a play that those in purgatory must watch until their redemption. To be honest, I think I'd have to watch this movie again in order to truly understand it. That's such a given for a Lynch film, but it's never been more true than with Inland Empire. Reading message boards and other reviews about it, I wonder if I missed a lot — like minor characters from the end of the movie appearing as background figures earlier on, like one actor playing multiple roles, like certain set pieces and items of clothing signifying one thing or another in different contexts. Since its release in 2001, Lynch's last film, Mulholland Drive, has come to epitomize subtle, non-linear and downright bizarre cinema. It's my favorite movie, and I credit it with helping me to better understand avant garde art and literature better than any professor or textbook ever did. But even Mulholland Drive can't hold a candle to the impenetrable Inland Empire. What I can say: It's definitely very Lynchian, with supporting roles by regulars Grace Zabriskie and Harry Dean Stanton. It makes curious use of cameos by the likes of Natassja Kinksi, William H. Macy, Ben Harper, Beck (in an unexpected musical cameo), Harring (out of her rabbit costume) and even Bellina Logan, an actress who appeared prominently as Louie, Ben Horne's concierge, in an episode of Twin Peaks to the point that a person who only saw that one episode might well assume she was a series regular. (Major trivia: Logan played Beany Thorn — the best friend of Dern's character in Wild at Heart — but had her scenes cut. In Inland Empire, she plays Dern's buddy once again.) The use of "The Loco-Motion" to disturbing effect is vintage Lynch. And all the usual fusions of happy-go-lucky kitsch culture and the depths of depravity that mark Lynch's every other effort appear here again..
As may reviews have noted, Inland Empire stands apart from Lynch's previous efforts by virtue of it being shot on digital video rather than film — and not high-end digital, either. Lynch reportedly used the midrange Sony DSR-PD150 for the project. The effect is, on the whole, positive. At the expense of clarity, Inland Empire's colors look amazing; the reds pop and the blacks envelop everything around them in perfect synchronicity with Lynch's style. I can't tell whether the effect was intention or not, but Lynch's trademark long shots had me staring at an almost motionless face for minutes on end in some scenes. When the film cut to a different shot, the image of the face — now burnt into my eyes — would fade in a ghostly manner in the blackness of the following scene. When I think about it, I'm glad I watched Inland Empire. I know I'll have to watch it again in order to properly understand it. And I'm glad that I didn't drag anybody I know — that is, anybody who doesn't share my adoration for Lynch — down to L.A. to go see it in theaters, as I'm pretty sure whoever I picked to go would have murdered me after sitting through three hours of such a confusing film. In short: rating pending. Beautiful, mysterious, haunting, to be sure. Good? Yes. On par with the likes of Mulholland Drive, Blue Velvet or Fire Walk With Me, however? I just don't have the experience yet to say. Laura Dern is AMAZING in this role. how did the academy overlook her??? Very true. I'm surprised I omitted that fact from my review, because the movie basically rests on her ability to act well in situations where her motivation isn't clear — to the viewer or even to her as the movie was being filmed, as I understand it. In light of seeing her in this movie, I can't believe I ever relegated to her to the status of "that lady from Jurassic Park who's married to Ben Harper." Granted, Dern would have been up against Helen Mirren — but she didn't even get the nominated. Boo. i love IE so much that i subscribed to google blog alert for it. i read your review and these two posts and i could not agree more. it's nothing against the other actresses nominated, but you guys are right. dern was robbed. she shot a whole movie with no script! she's a genius. thank god lynch is aware.